Well, 9 months from my last post and a lot has changed. I now have two “helpers” in my kitchen, Cameron, who is 1.5 year old and new little girl, Ashtyn. It slows things down and makes everything a bit more messy, but I’m loving the slow pace of life at home with two littles. I’m excited to be home with them full time and have a bit more time for blogging. I wish I could say that I typed up this post one rainy afternoon while they both took a nap (just like I imagined months ago), but the reality is that I typed it in bits and pieces between naps and fits and feeding sessions. Hopefully, I’ll be able to share recipes and life snippets here a little more frequently, then past days. I love this little creative outlet of mine and I’m excited to work on it during naps and the rare quite moments I get here and there. 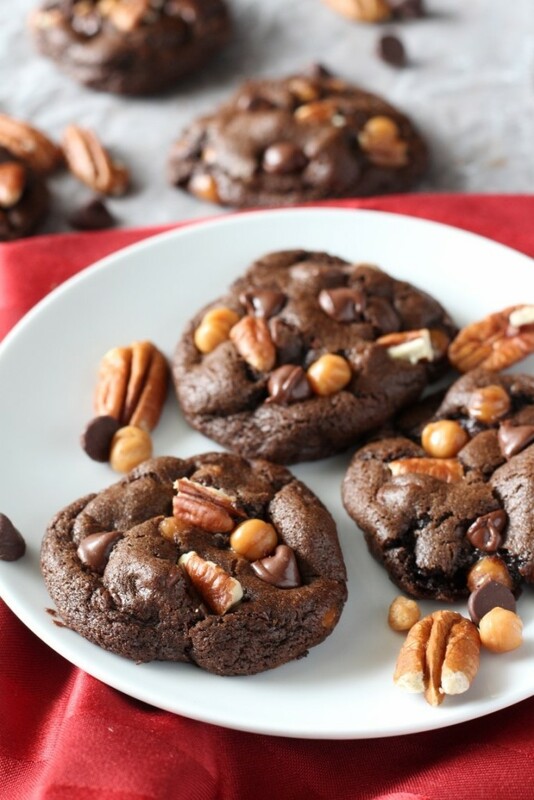 These turtle cookies use the same dough as my triple chocolate cookies and caramel stuffed double chocolate cookies. 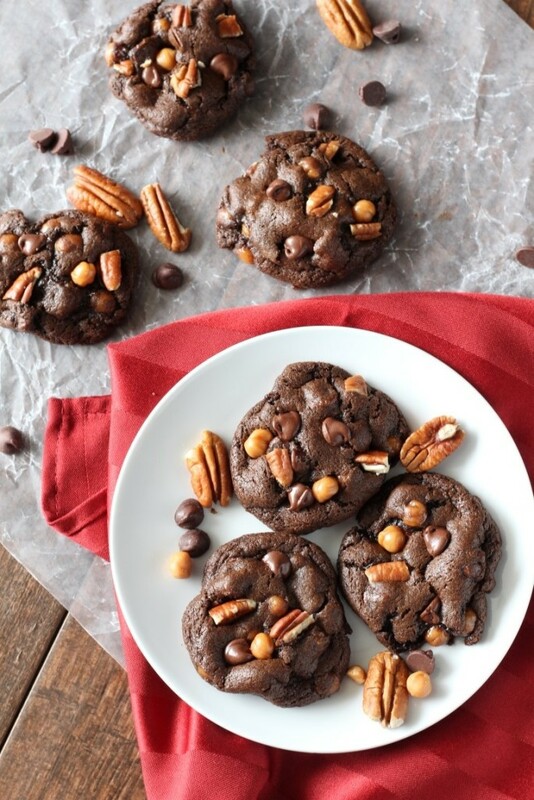 It’s my go-to chocolate cookie dough that always yields a nice thick, chewy cookie. 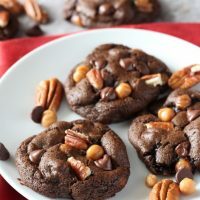 I was craving something a bit different and threw in some caramel bits and pecans along with the chocolate chips for a fun chocolate turtle cookie variation. Plus, by adding pecans, I guarantee myself the entire batch since Tyler doesn’t like them. Does anyone else keep a stash of cookies in the freezer for cookie emergencies? It’s pretty dangerous, but who wants to stir up a batch from scratch when the cookie craving hits? 🙂 These are perfect for stashing in the freezer. Either eat them straight from the freezer or warm them up in the microwave for a few seconds. Whisk together the flour, cocoa powder, baking soda, salt and cornstarch. Stir into the wet ingredients. Gently stir in the pecans, chocolate chips and caramel bits. To make the cookies pretty reserve a few of the pecans, caramel bits and chocolate chips to press into the dough balls. Chill the dough for at least 3 hours. 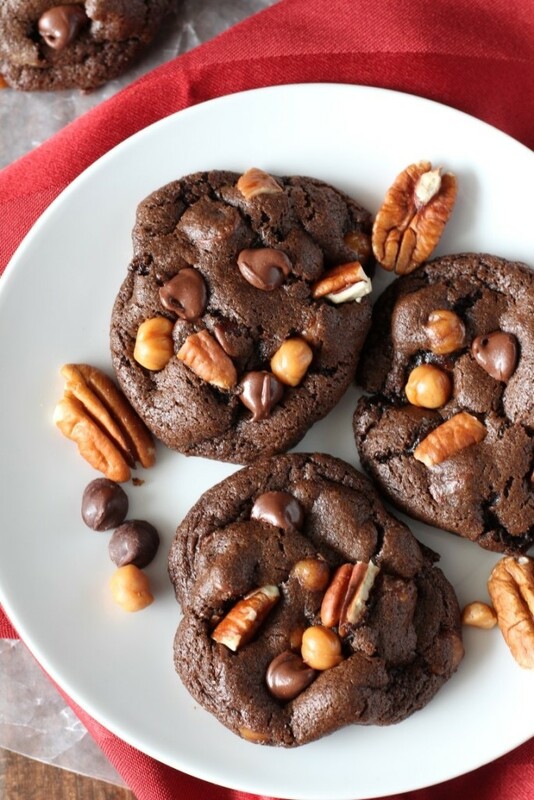 Preheat the oven to 350 F. Roll the dough into 1 inch balls, press in extra pecans, caramel bits or chocolate chips if desired and bake for 9-11 minutes or until set. Do not over bake the cookies. They should like slightly doughy when they are taken out of the oven. Let cool on the cookie sheet for a few minutes and then remove to a wire rack to cool completely.